There is a timely piece in The Times by Michael Gove about what has become "a feature of seasonal journalism", i.e. pro-Palestinian militancy in the run-up to Christmas. "Eggnog lattes on sale at Starbucks? Feature-length M&S commercials? There’s one invariable sign that Christmas is almost upon us - a story about how Bethlehem is suffering at the hands of wicked Israel. It has become almost as much a feature of seasonal journalism as stories about how Nativity plays are being subverted and commentaries on how commercialism is snuffing out the true meaning of the festival. 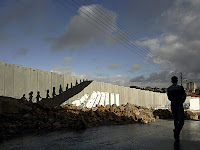 This year we’ve already had our first exercise in demonising Israel for its treatment of Bethlehem with the graffiti artist Banksy enjoying extensive coverage for his trip to decorate the security barrier near the town with his work. The message of Banksy’s work and the coverage it has generated is the same: oppressive Israel has snuffed the life out of the town where the Prince of Peace was born. Herod’s spirit lives on, even as the spirit of Christmas is struggling to survive. The truth is very different. The parlous position of Palestinian Christians, indeed the difficult position of most Christians across the Arab world, is a consequence not of Israeli aggression but of growing Islamist influence. Israel goes out of its way to honour sites and traditions sacred to other faiths while the radicals who are driving Palestinian politics seek to create an Islamist state in which other faiths, if they survive at all, do so with the explicit subject status of dhimmis. But when it comes to Israel’s position in these matters it’s still a case of O little town of Bethlehem, how still we see them lie."